Oglaend System's Anti-Vibration Fasteners prevent self-loosening and cater for quick and safe installation. Once a fastener is tightened it remains tight, in turn minimizing maintenance costs once installed. The unique thread design of our Anti-Vibration Fasteners distributes the stresses evenly across the engaged threads. While conventional thread design applies a high concentration of stresses on the first thread, the self-locking fastener distributes the stress evenly on all threads. More importantly, the fasteners prevent loosening from vibration, which makes it suitable for any industrial environment. DROPS (Dropped Object Awareness and Prevention) highly recommend using Anti-Vibration Fasteners. All metal fasteners have been exposed to some of the most demanding onshore and offshore environments. Being made of A4 grade steel they are highly corrosion resistant and are effective at temperatures as low as -60 °C. That is why they are included as standard for the majority of our Stainless Steel (SS) products. Self-locking fasteners are included with other materials we supply, however; these do not include the anti-vibration feature. Oglaend System’s Anti-Vibration fasteners drastically cut down installation time, while simultaneously maximizing system durability. The flange nuts are free running onto bolts with no resistance and the self-locking feature of the bolts allow for tightening with just one hand and one tool. Less parts leads to improved logistics. 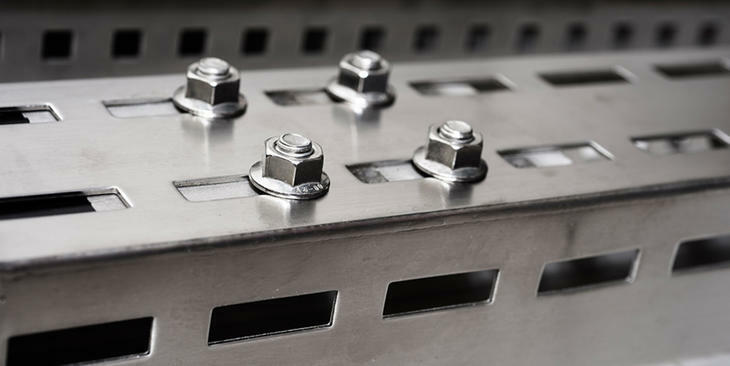 Anti-Vibration Fasteners offer a safe solution for any industrial environment, and at the same time reduces installation time and costs related to maintenance.